Fire has both positive and negative impacts on a watershed. A watershed is an area or ridge of land that separates waters flowing to different rivers or basins. The Valles Caldera is a bowl shaped volcanic caldera that collects water from surrounding ridges and funnels the water down stream through the Jemez Valley. During a high intensity fire the soil can be can heated to the point of being impermeable and during a high volume rain events erosion can be severe. On the other hand, low intensity fires can help maintain a healthy watershed by storing and filtering water. The Fire and Watershed unit helps answer the burning question: "How does fire impact the watershed?" Fire and Water are inextricably linked. Erosion of ash and soil starts at the top of the watershed and depending on the severity of burn it can be catastrophic. 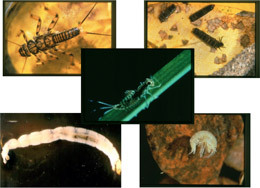 In the Labs and Activities section below, there is a student activity sheet labeled "Fire and Watershed Research Graph and Questions" for students to use in interpreting the graphs that show macro-invertebrate populations. Dr. Gerald Jacobi is Professor Emeritus of Environmental Science and Management at NM Highlands University in Las Vegas. He has a Bachelors degree from Colorado State University in Fisheries Science, an MS degree in Zoology from Colorado State University, and a PhD in Environmental Biology from the University of Utah. His primary interest is on the distribution and abundance of aquatic macroinvertebrates in relation to man-induced perturbations and the effects of fire and flooding on macro-invertebrates. 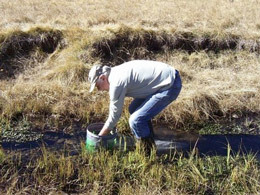 He, along with his wife, Donna, and others recently completed a guide for the NM Environment Department on using aquatic macro-invertebrates to assess the condition of surface waters throughout the state. Nature Conservancy: How are Fire and the Santa Fe Watershed Linked?